I always enjoy working with clients who have a passion for cooking. It’s fun to talk about not only appropriate storage needs and aesthetic desires, but also the virtues of various olive oils, cookware, and techniques. This particular project also had an additional perk – it was challenging. You see, we wanted to create a cook’s kitchen in a small condo at Mt. Vernon. The client wanted what I believe at the time was described as ‘Transitional Tuscan’. 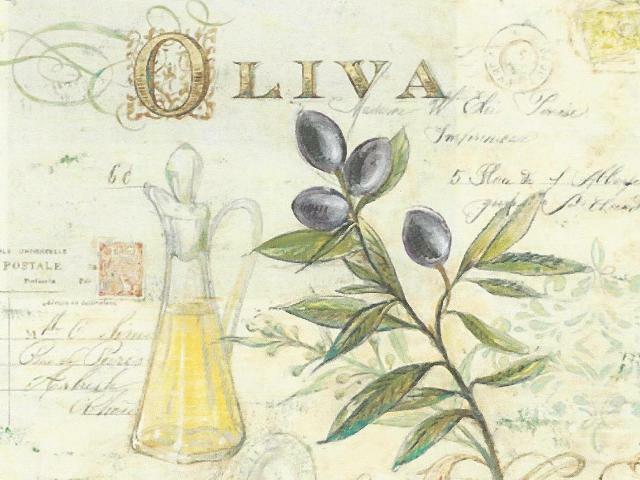 She had found a print styled to look like a postcard, depicting an various stages of olive oil that became the color palette, but she wanted none of the weathering or detailing that is normally associated with a Tuscan look. I’ve designed many small kitchens in condos, but creating a cook’s kitchen in a small space is often like trying to get 10 lbs. of flour to fit into a 5 lb. bag, something is going to spill over. Built-in appliances were a given – the ergonomic and mechanical functionality they can bring is essential for a serious cook; a full-size refrigerator was also necessary; and a coffee bar/serving area adjacent to the dining room was also on the list of must-haves. One saving grace for me – this client wanted to keep some formality for her dining area, and therefore wanted the kitchen to stay a separate room. Why is that good? Because I didn’t have to eliminate walls to open up the space like I did for this Mt Vernon renovation. 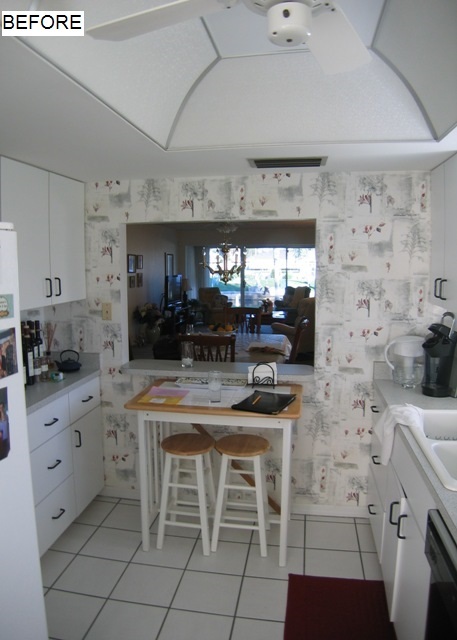 More walls means more flexibility in the kitchen design. 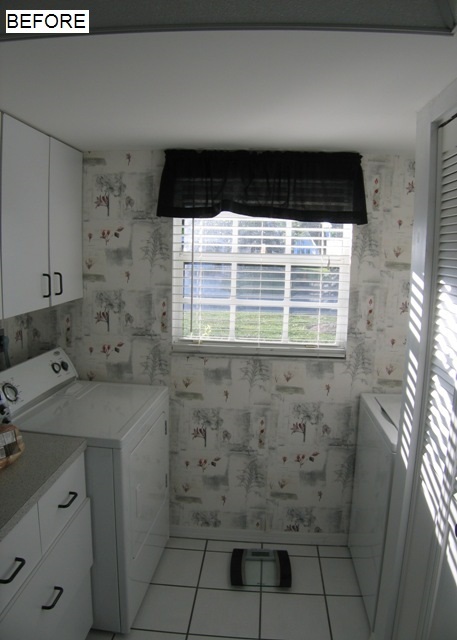 To make matters more interesting, the kitchen also doubled as a laundry room with no defined area for a washer or dryer (notice the ‘BEFORE’ photo, click to enlarge). 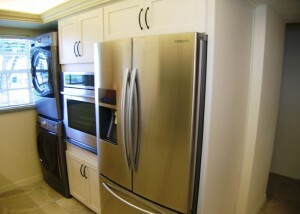 There was no place else to locate these appliances so they had to stay in the kitchen – but be inconspicuous. A galley kitchen, with everything a serious cook can desire. 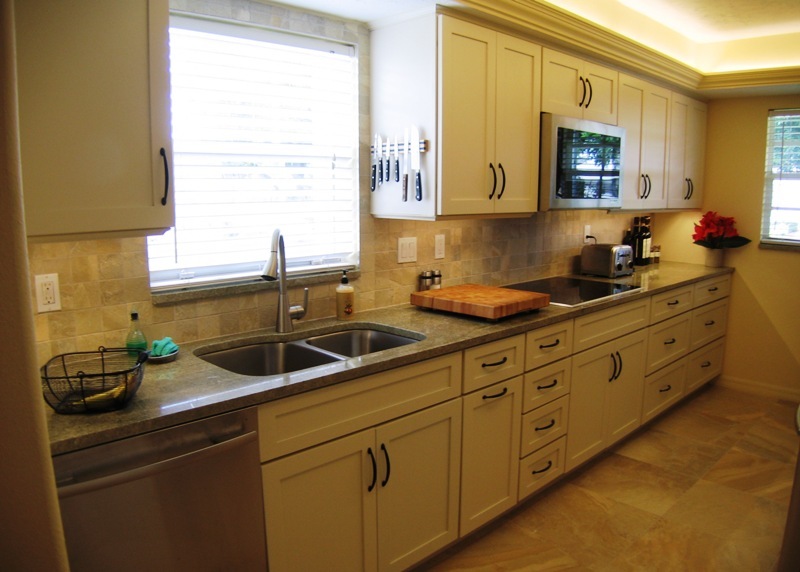 A galley kitchen with plenty of room to create is exactly what the client wanted. 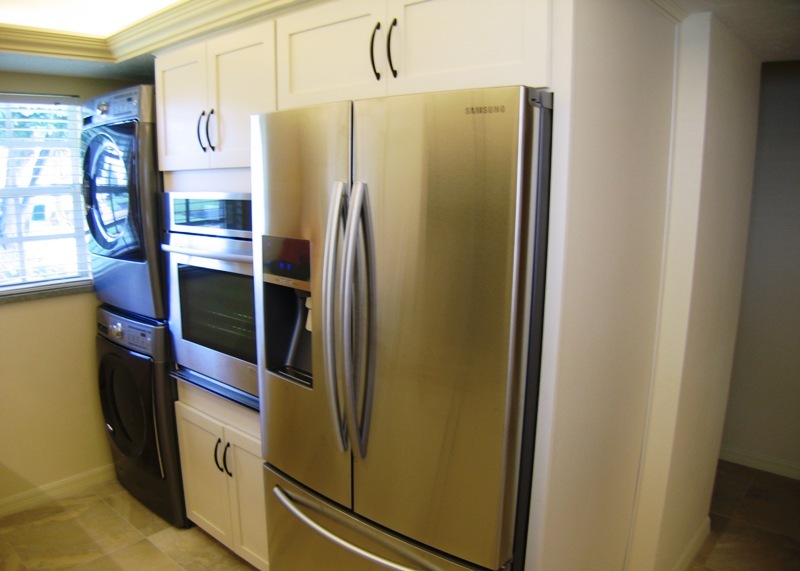 By grouping the big appliances together, it actually maximizes the visual space. 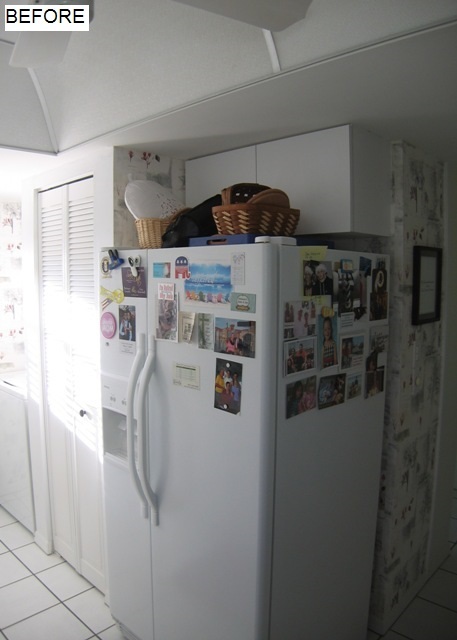 Stacked washer and dryer were hidden by an extra-deep oven cabinet and refrigerator alcove. Deep drawers were used almost everywhere to accommodate her various cooking vessels, and roll out trays were added under the cooktop for pots & pans. The coffee bar/serving area was created by stealing space from an underutilized hall closet. Trash is convenient but concealed next to the sink, and indirect cove lighting is paired with LED under-cabinet lighting to satisfy the homeowner’s ‘no can lights’ edict. Choosing the Simplicity door style from our private Stressless Collection of cabinetry allowed the homeowner to maximize her budget without giving up the essential details and accessories she wanted. 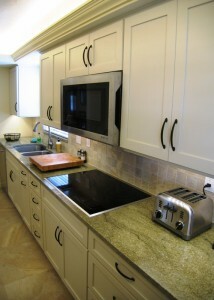 The Almond Butter painted finish warms up the cabinetry just a little to keep with the Tuscan colors. Paired with Coast Green granite (sealed with a 15-year dry coat process for less maintenance), stainless steel appliances, and black handles, the cabinetry contrasts nicely with each element. Rounding out the finishes are matching floor and backsplash porcelain tile which resembles sandstone adds a rustic touch that nods towards the Tuscan. All in all, I’d say they were happy: I went home with 2 bottles of gourmet vinegars and two of the best olive oils I’ve ever tasted. As I said, I enjoy working with clients who have a passion for cooking. 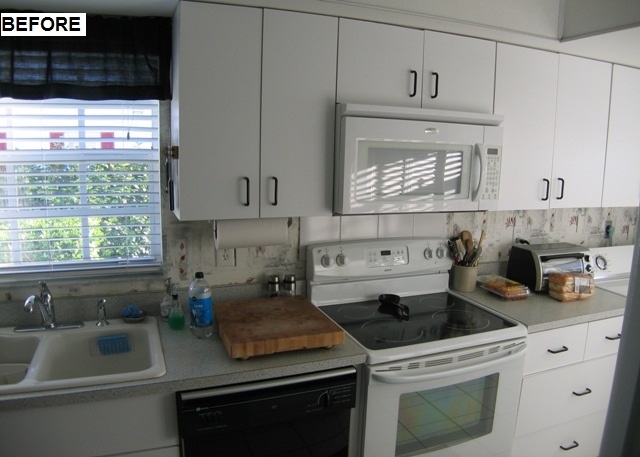 If you’re kitchen layout leaves you uninspired, we can help. Leave the worrying to us. Contact us today to get started. 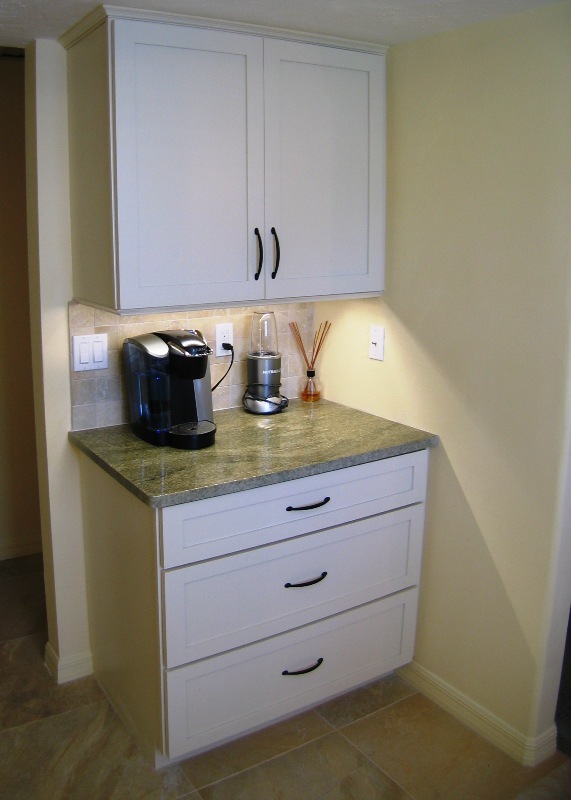 This entry was posted in Design and tagged Almond, granite, green, kitchen, kitchen design, remodel, Stressless Collection, Transitional, Tuscan, white. Bookmark the permalink.